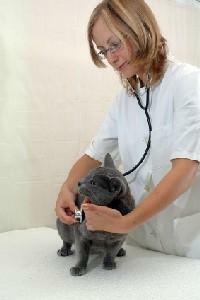 Developing a good relationship with your veterinarian is an important part of caring for your cat's health. Get insider tips for making sure you and your vet are on the same page when it comes to your kitty's well-being. Today I am here to give you some tips on how to establish a good relationship with a vet. I myself have had to change veterinarians in my 28 years of owning pets. Sometimes it is because of a move; but more often than not, it is because my needs have changed or my vet has moved. When I say that my needs have changed, I'm referring to one time when I had a dog that needed special knee replacement surgery. Therefore, I needed a surgeon that specialized in knee surgery. What I personally like to have for myself, and am lucky enough to have found, is a wonderful all around vet who has an amazing staff and team. Their offices are always clean, and my vet has updated new equipment. My vet tends to be on the cutting edge, but also practices with some Eastern philosophy. I like the East meets West idea. And if and when I need a specialist, my vet works very closely with me to help me find the correct specialist and the correct fit for my family and I. This is all very important when picking your vet. Please don't go to the Yellow Pages if you don't have to. Ask your friends, family members and co-workers for references. If you are a member of a religious organization, that is also a wonderful place to ask. See your vet one to two times a year for a health check-up and yearly shots. Using your veterinary hospital as an emergency room leaves little time to make friends and have pleasant experiences. Set an appointment with the veterinarian you have chosen when nothing is noticeably wrong with your pet. Engage the vet in conversation until you get to know his/her style with you and your pets. Bring in a single pet, not a carload; you don't want to overwhelm the vet all at once. It is also nice to bring a friend, be it a loved one or just a friend. It will help if you have a second opinion accompanying you, especially when you are in a stressful situation with a sick or injured pet. It's always best to set up an early morning appointment. I like this time best, because the staff and the vet are fresh. If you need to leave your pet, with any luck, it will be just for the day and not an overnight visit since you've come in early. Your vet should have clean large kennels in back with 24 hour supervision, and you should be able to call at any time to check on your cat. If he is not willing to show you his kennels, look into getting another vet. I find it always helps me to have my list of questions written out on a piece of paper to bring with me to the vet. With so much going on in the room, you will be focused on your pet. It is easy to forget important questions. I suggest you take five minutes the night before your appointment and make a list. Remember to ask questions when you do not understand. Your vet should always be happy to answer any and all questions, and this should include the staff out front. You'd be surprised how many times I call my vet's office just to ask a question of the receptionist or maybe to a vet tech, so I know I'm on the safe side. I have even been known to call my vet's office to make sure the information I'm giving you in my Two Minute Pet Tips is correct. They are always happy and willing to help me. You also want to establish this type of relationship with your vet. Be nice. I find in life in general, I get further with honey than vinegar. When you are nice, friendly and outgoing, people tend to respond back the same way. This can only help you if (God forbid) you have an emergency. Your vet's office will think: Wow, Mrs. Jones is always so nice, and she sounds very stressed and scared right now; let's try to help her. I am known for networking, and when I find a vet that I love, you better believe I'm happy to tell my friends. You should do the same. This goes a long way with your vet and with your friends in need who are looking for a vet.